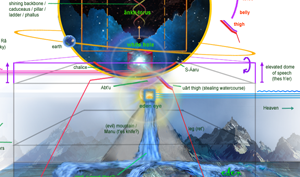 ... to visualize PT 366 : on the left a Vedic depiction of this very theme, called "the churning of the milky ocean": you see the deities revolving the ãnkh-pillar upon it's axis; the pillar stands upon the turtle [in glyphs SHET, from soulpool SH], and the milky ocean around, in glyphs UATCH UR, "the great green sea" , where both the 'milk' and the 'green' correspond - since both mean "green, young, healthy, abundance". On top of the pillar is Vishnu/Anubis, who rules the north Vesica. 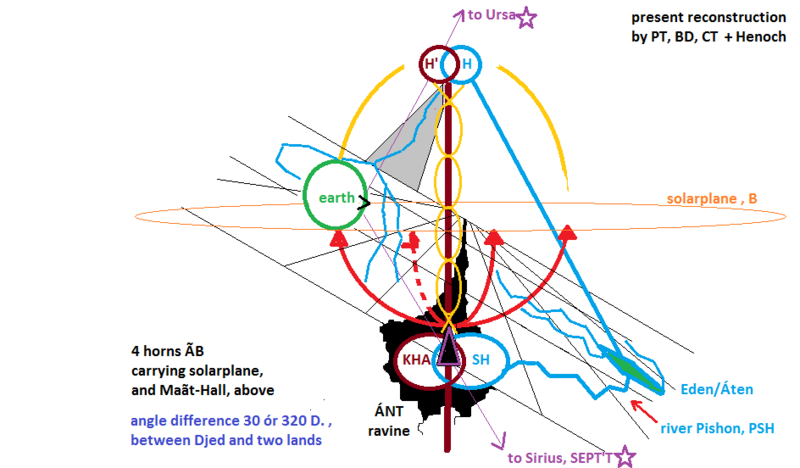 2]...next, we have PEKHAR, also "to revolve" etc ; because of the nature of this glyph, it will be used only for the root (P) revolving - and that may be both the whole south as root [by the Kha lake], but also the vesica in the nórth: since its inversion is KHEPer, the god of Transformation working in the vesica in the North. 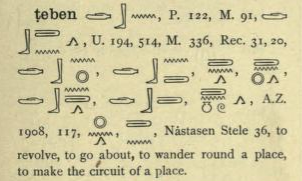 - We hope to dive into this most important topic, soon; there is a reason why the one of four rivers from Eden is called PSHN, containing in [glyphs] P and SH ; and why "four"; but also related to the tower of Babel, in (scriptural) Shinar, where the [glyph] for the sacred serpent is SHENÃR; and the relation to the revolving starry sky around us [! 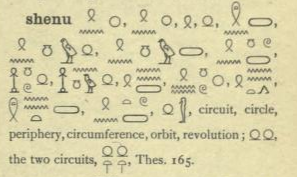 ], depicted in the [glyph] of Orion, SQET'T, "travelling boat of Orion". 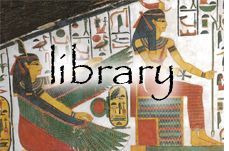 - in the original glyph texts, it took time to understand that one time "the encircling coils" are addressed, while other times "the encircled gods in the Shen"; we hope to upload those series soon; when they use [glyph] "covering", SHEN, they address the serpent coils siphoning upon the covering of the gods imprisoned within the SH-pool, etc. 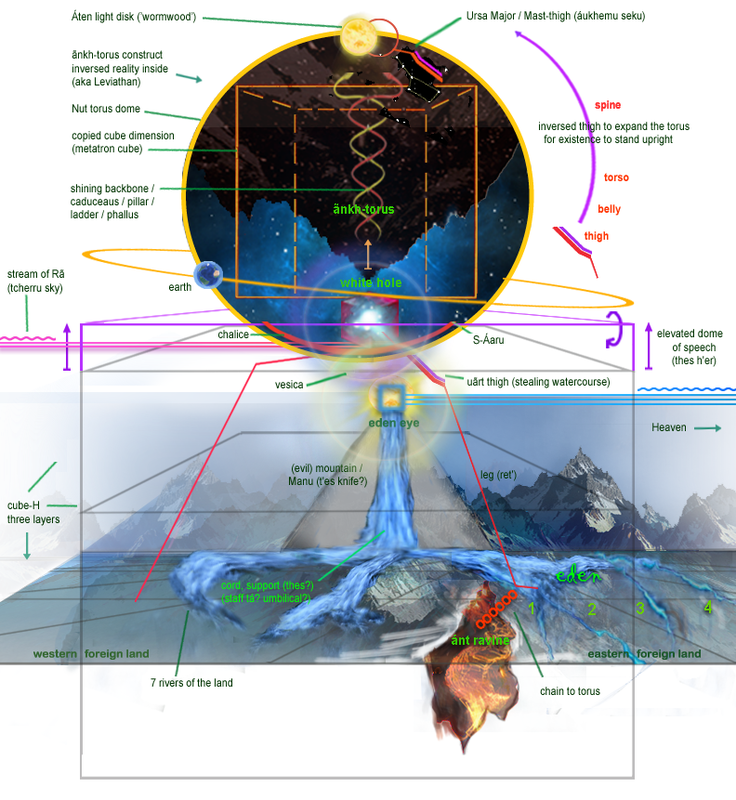 Important for us will also be the "rotating of light in the Northern vesica", where a rotating wall of (dimensional) physical flesh forms our "I"in its centre ; and then (somehow) makes each of us connect to that. Either way, this rotating light to Alter reality changes Time, and the "time" as wé know it, is nothing else but the [slow!] time of the solarplane, likely diminished with a factor 8, according to the UN-cluster. ....nice detail: the hidden background of Saturn, in 366, is h'anebu : officially "the area of the Greek mediterranean", but also the nazi Ufo project.